I finally committed the crime I said I’d never commit: I made a parental decision based on what everyone else is doing. How lame is that? I broke down and got an iPhone for my 12 (and a half)-year old daughter. I felt (feel) that that’s too young to mess with something as hedonistic as a smart phone but my hand was forced. She’s got a lovely group of girlfriends. They all do well academically. They’re polite and can hold their end of a conversation. They’re the types of kids I want her around. And they’ve all got iPhones. ALL OF THEM. 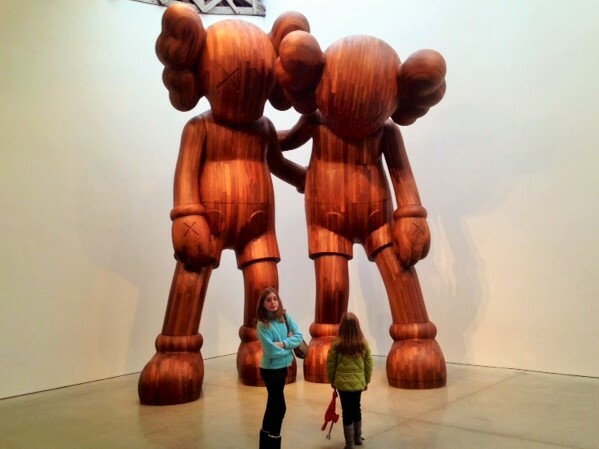 When they group text or share photos, Daughter Dear is left out of the loop. I know how that feels. I spent my entire childhood out of the loop and if I can spare her that burden by breaking one of my rules, I’ll break it. I don’t want her drifting to a different crowd because she was disconnected. This has lead to no small amount of angst, worry and sleepless nights. I’ve taken a dramatic and, some would say, unethical step. I loaded tracking/monitoring software onto her phone. You can lecture me all you want about trust and privacy issues but, Jesus H. Criminy, she’s just 12 (and a half). I don’t think ANY 12 (and a half)-year old girl should be left on her own to navigate the scary world of Instagram. I don’t feel good about reading her text messages. It makes me feel kind of dirty. But I’m in a no-win situation. I’m finding that “little kids, little problems/big kids, big problems” is more than just a clever turn of a phrase. It’s pregnant with truth. I wonder if any of the other parents monitor their kid’s mobile phone use? Could you accuse them of being lazy and uncaring if they don’t? What would you do? 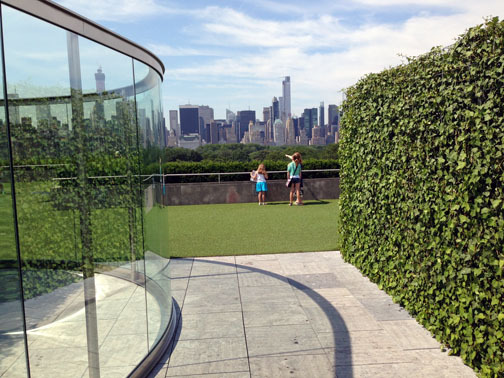 We made our annual pilgrimage to the roof of the Metropolitan Museum of Art for the summer installation. Every year they do something special on the roof and every year I drag the kids up there whether they like it or not. (I think they like it.) We arrive when the museum first opens so that we have the roof to ourselves. Some of these installations are pure genius and some of them fall flat. This year’s model lies somewhere in between. 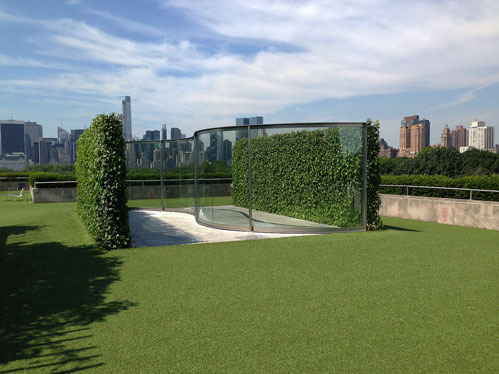 The Roof Garden Commission by Dan Graham is an interesting “S” of steel and glass set between two ivy hedgerows. 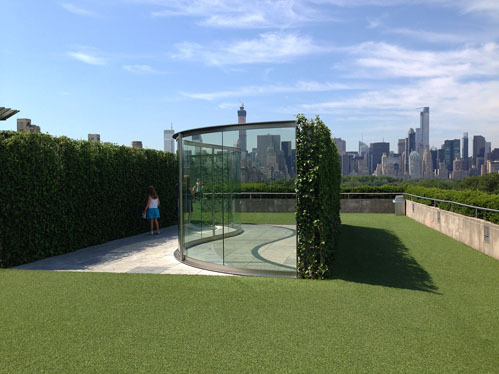 The roof was covered with grass (actually artificial turf) and is meant to be viewed in conjunction with the lush greenery of Central Park. The interesting part, the “get,” is the glass. 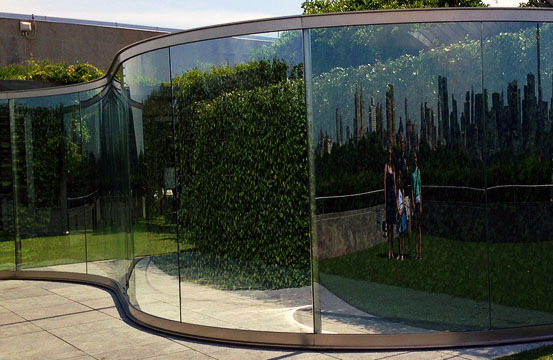 It’s two-way mirrored and while completely translucent from one side, you see a gentle refection from the other. It’s a neat trick. You can still see through the reflective side, but the ghosted images of the city can be seen distorted in a half-circle. It makes for a fun family portrait. I wish it were a larger exhibit. Once the crowds arrived, it lost some of its magic. 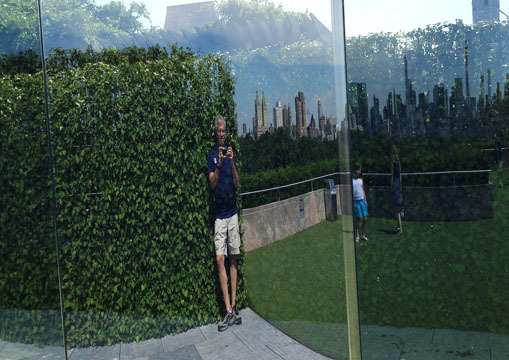 People waited in line to take photos from the best, most reflective, angles. It’s an interesting enough piece although I was somewhat underwhelmed. To date, the best installation I’ve taken them to—hell the best one I’ve ever seen—was Brazilian artist Ernesto Neto’s anthropodino at the Park Avenue Armory in 2009. THAT’S how it’s done. After the museum we saw a Broadway musical. Despite visiting the theater on an almost weekly basis, the fact is, with a few exceptions, I can’t stand Broadway musicals. Quintuple my nausea if there are children on stage. Broadway kids are the worst. They’re precocious, overly-talented mini-adults. Behind each one, giving a good hard shove, is a failed actress trying to relive the dream. 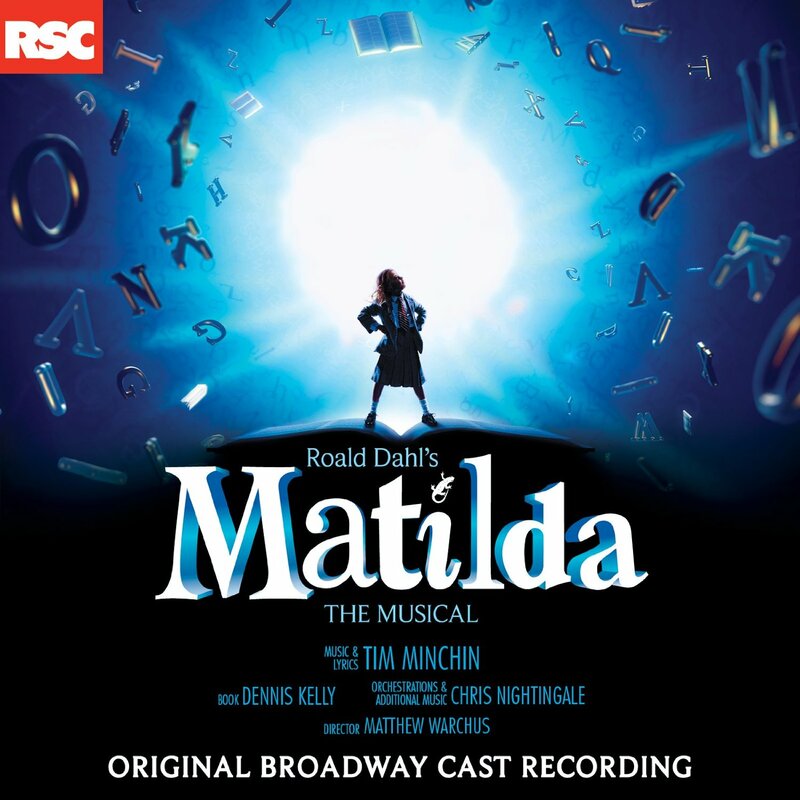 My kiddies wanted to see Matilda and since I’d be willing to take a bullet for them, suffering a musical seemed like a small matter in comparison. So there I was at the Shubert Theater for a Saturday matinee with a stage and house full of children. Dreadful. Strike up the overture. Let’s get this over with. “Oh, my undercarriage doesn’t feel quite normal. My skin looks revolting in this foul fluorescent light. How can you not like that? Thank you, Royal Shakespeare Company.